The Russian River Watershed covers 1,500 square miles of urban, agricultural and forested lands in northern Sonoma County and southern Mendocino County, California. Communities in the Russian River Watershed (RRW) depend on a combination of Russian River water and groundwater to meet their water-supply demands. Water is used primarily for agricultural irrigation, municipal and private wells supply, and commercial uses - such as for wineries and recreation. The Russian River is prone to droughts and floods (experiencing the highest recurrent flood damages in California). This hydrologic variation is due in large part to the prevalence of atmospheric rivers (AR) that flow through the area, bringing nearly 50 percent of the precipitation on average to the watershed. This "flashy" precipitation, and other challenges including managing flows for fisheries, responding to extreme climatic events, increasing water demands, preventing streamflow depletion, and ensuring long-term groundwater sustainability present significant challenges for water and environmental resource managers. The U.S. Geological Survey (USGS), in cooperation with the California State Water Resources Control Board (Water Board), Sonoma County Water Agency (SCWA), and other local agencies, is conducting a hydrologic study that will refine understanding of hydrologic system, and provide an integrated watershed/groundwater-flow model of the Russian River Watershed. This cooperative project will provide much of the hydrologic information needed by SCWA, the Water Board, and other RRW stakeholders to better understand the potential impacts of climate variability and change, and associated changes in groundwater use on groundwater levels, stream discharge, stream-aquifer interaction, and water quality. The project also will provide the information and models needed by SCWA, the Water Board, and others for improved decision making regarding the RRW’s surface- and groundwater resources. Development of an integrated hydrologic and reservoir/river operations model for the RRW will allow for better management of all water resources in the watershed. 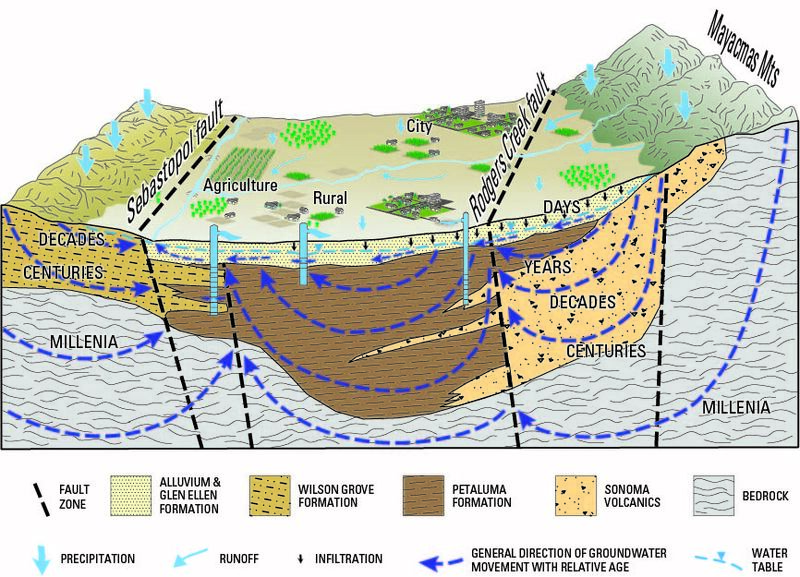 Study results will help local groundwater-sustainability agencies (GSAs) create groundwater sustainability plans (GSPs), as mandated by California’s Sustainable Groundwater Management Act (SGMA). Location and geology of the Russian River Watershed. The map also shows the portion of the watershed being studied. The drainage area of the Russian River is in the northern part of the California Coast Ranges section of the Pacific Border province (Fenneman, 1931). The northern Coast Ranges trend northwestward, parallel to the major structural features of the region. The mountain range that lies west of the Russian River valley and extends to the coast is commonly called the Mendocino Range, or the Mendocino Highlands. The highland area east of the lower and middle Russian River valley areas is known as the Mayacmas Mountains (fig. 1). The altitude of the highlands ranges from about 2,000 to 6,000 ft. The highest point in the Coast Ranges, at an altitude of 6,381 ft, is on Mount Sanhedrin, about 15 mi northeast of Willits. The altitude of the divide on the west side of the Russian River ranges from 1,400 to 3,000 ft; and on the east side, from 3,000 to 4,000 ft. The altitude of the mountains bordering the Russian River increases slightly from south to north. The proposed study area is drained by the Russian River (fig. 1), a principal river in the northern coastal area of California between San Francisco and Eureka. The Russian River begins about 16 mi north of Ukiah and flows southward for about 90 mi through alluvium-filled valleys and mountain gorges to Rio Dell. There the river turns abruptly westward, crosses the Coast Ranges, and flows to the Pacific Ocean at Jenner, California. The entire river is about 110 mi long, but the drainage basin through which it flows is about 85 mi long. The valley of the Russian River ranges in width from 12 to 32 mi and the watershed has an area of about 1,485 square mi. There are 12 USGS-operated stream gages on the Russian River. Lake Sonoma and Lake Mendocino (which receive water from the Potter Valley Project) are reservoirs that supply water to the Russian River. The supplied reservoir water is important for Chinook salmon and steelhead trout fisheries and for water supply. Lake Sonoma supplies water during the fall and winter to sustain Chinook salmon and steelhead trout habitat. Lake Mendocino is an important source of water for cities and agriculture within the upper Russian River basin above the confluence of Dry Creek. Both reservoirs are important for municipal, industrial, rural, and recreational uses. In order to better understand surface-water and groundwater issues in RRW, the USGS is proposing to characterize the integrated hydrologic system of the RRW. This study will include the effects of variability in climate, geology, biota, and human activities (including regulatory effects) on water availability and surface-water flow in the RRW. The characterization of the RRW will require the development of a Geographic Information System (GIS) database, data compilation, data collection, and the development of a coupled hydrologic and reservoir/river operations model. Specifically, the USGS-developed integrated Groundwater Surface-water Flow model ( GSFLOW; Markstrom and others, 2008 ) and the reservoir and river operations model MODSIM ( Labadie and others, 2000 ) will be used. An important component of this project is outreach to the various stakeholders in the RRW, including local agencies, communities, water managers, and agricultural entities. In order to help solicit information and data that will benefit the project, it is important that this stakeholder input be received early in the process. This outreach will be conducted to receive broad stakeholder input regarding the identification of important water-resources issues in the RRW. It will also be used to help gather data and insights into the hydrologic system and how it is utilized and managed. Although groundwater is managed locally on an informal basis, there are two agencies that manage the Russian River: the SCWA (water supply) and the Army Corps of Engineers (flood protection). Local stakeholders will provide important insight to improve understanding the Russian River system in addition to the challenges in using and managing water resources in the watershed. Stakeholder meetings and information dissemination will occur throughout the life of the project so that all parties are kept up to date on study findings. For the study, the USGS will compile existing data from cooperating agencies and other sources; collect new data; and integrate and analyze the new and compiled data. Data will be compiled into a Centralized Geospatial Database. Existing maps of climate, surficial geology, vegetation, land use, well locations, stream networks and reservoir information, and digitizing of drillers’ logs will be compiled. Drillers’ logs and geophysical data will be used to define and map alluvial thickness, regionally extensive aquifers (coarse-grained material) and aquitards (fine-grained material), depth to bedrock, and other general hydrogeologic features. Data used to estimate annual groundwater discharge will also be compiled. These data include: pumping, land-use, vegetation type, and vegetation density. The USGS will conduct new data collection and analysis, with a focus on water-quality sampling of the RRW. These efforts will be designed on the basis of the preliminary model results and error evaluations. Data-collection campaigns for the RRW characterization will be designed according to the need to further refine the conceptualization of the hydrologic system. Where possible and practical, preliminary model simulations will help guide the collection and characterization. Specific tasks will include refining hydrologic budgets and updating conceptual models of the groundwater-flow system based on the new data and the results of ongoing USGS geologic studies in the basin. Water-quality samples will be collected from selected wells, springs, and streams. These activities will require significant landowner and stakeholder participation. Initially, existing wells will be used and selected based on compiled data in the GIS and in consultation with SCWA and stakeholder technical staff. Sampling will focus on delineating the source and age of groundwater in the main water-bearing zones (aquifers) and characterizing the current water quality. The sampling will build on recent water-quality data collected as part of the USGS Groundwater Ambient Monitoring and Assessment (GAMA) program (Kulongoski and others, 2006; 2010; Mathany and others, 2011). For this study, water-quality analysis will include basic inorganic constituents and nutrients. The stable isotopes of oxygen and hydrogen will be used to provide information on sources of recharge, and tritium/helium and/or carbon-14 analyses will be used to provide information on groundwater age and travel time. Specific analyses of constituents of particular concern, such as arsenic, iron, manganese, and nitrate also will be conducted. Identify geochemical, hydraulic, and hydrogeologic data gaps. USGS geologists will develop a geologic framework model of the RRW that will be a foundation for the integrated hydrologic modeling. Example of a conceptual model of a hydrologic system. Possible future climate and land-use change effects on the water-supply systems. The new integrated modeling tool will provide detailed analyses of water-use forecasts, climate-change impacts, and other water-management issues. Future hydrologic and water-use conditions will be simulated for the next century using six different climate projections. Models will be developed and linked to simulate the groundwater/surface-water system in the RRW. The three types of models that will be used include Basin Characterization, GSFLOW, and MODSIM models. The existing Basin Characterization Model (BCM) will be updated and used as the foundation for the climatic data in the RRW. The BCM helps resource managers better understand climatic conditions and the potential future hydrologic situations the RRW may face given possible climate-change scenarios. Maps of hydrologic output variables for (A) average recharge (net infiltration below the root zone) for water years 1981-2010 and (B) change in average April 1st snow water equivalent (SWE) between 1951-1980 and 1981-2010 calculated by the Basin Characterization Model for the California hydrologic region. 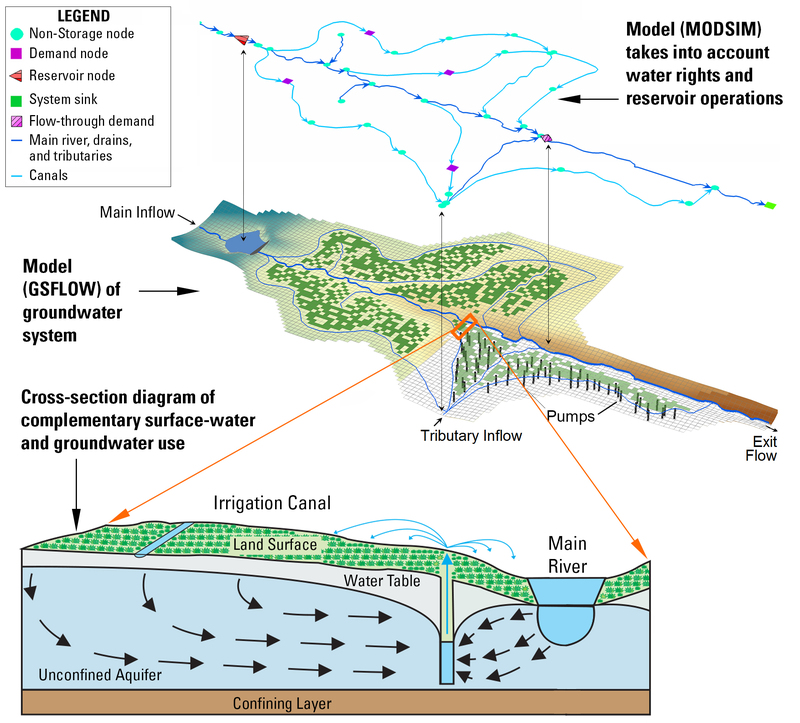 GSFLOW is a coupled surface water/groundwater flow model that is comprised of two different model components: a watershed-model (Precipitation Runoff Modeling System [PRMS]) component, and a groundwater-flow model (MODFLOW) component. The GSFLOW model will accurately simulate the interactions of surface water and groundwater that occur in the system. A MODSIM reservoir-management model will be developed based on SCWA’s existing reservoir simulation model. MODSIM will be then be coupled with the GSFLOW model, to create a model that can be used to estimate water supply under various human-influence scenarios. The USGS will provide quarterly updates to the Water Board, SCWA, and local stakeholders. In addition, USGS personnel will meet with the Water Board, SCWA, and local stakeholders on at least an annual basis. A USGS Scientific Investigations Report characterizing the hydrology of the RRW and summarizing results of the GSFLOW model of the RRW is planned for completion by the end of October, 2019. The characterization of the RRW will be based on the hydrogeologic and geochemical analyses. The GSFLOW model will be documented by describing the conceptual model, model development, model calibration, model results, and water-use scenarios. The report will include an integrated assessment of the response of surface- and groundwater resources to changes in water demands and climatic influences. The model will be developed to help water managers and interested stakeholder better manage their watershed system demands by providing water-use scenarios and estimating the effects of water-use decisions both numerically and graphically. Uncertainty analyses generally will be incorporated into these model runs, particularly with regard to the impact of pumping, given the sparseness of available data. An agreed-upon set of scenarios will be developed based on input solicited from participating water managers and interested stakeholders. One of these scenarios will evaluate the impact of climate change on water supply reliability.